Yesterday, there was one paperback copy of The Hunger Games squeezed in-between other trade fiction. Two hardcover copies of Mockingjay were together on an opposite shelf. 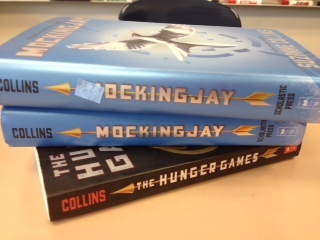 These books from The Hunger Games Trilogy by Suzanne Collins had been donated to a local Goodwill store. When I found them tucked away on the store’s shelves, I knew that the series had met a tipping point: still popular but not popular enough to treasure and keep. The Hunger Games series (2008-2010) has been to today’s graduating seniors what the Harry Potter series (1997-2007) was to today’s 28 year olds…a collective reading experience. The series developed a dedicated young adult following, and the most obvious signs of their dedication was the carting of hardcover editions because each reader could not wait for the book to go to paperback. Once The Hunger Games series caught fire (literally), book conversations centered on Katniss. There were speculations on her choice of Gale or Peeta. Predictions on the fate District 13 were rampant. The publication of each new book in the series was a major event; students shared copies from period to period. When the first film, The Hunger Games, came out students critiqued every detail that was present and noticed every detail that was missing. Our Reading/English/Language Arts teachers loved having students read these books as well. The series laid the connections to more traditional texts such as the Greek myths or Romeo and Juliet. There were plenty of connections on current events in the economy and media that could be made as well. Finding three copies in the used book shelves now, however, signals a sputtering of interest. Students will still pick up the used copies from the book carts in the classroom, but the rabid fans have moved on. Collins has helped this year’s graduating seniors develop their independent reading skills, the kind of skills that will serve them well in the future.